This week I’m at our Aikido national summer school. As the name suggests, it’s something that happens every year (as does the winter school). But this one is a bit special. This time around we’re celebrating 50 years of Aikido in Australia. 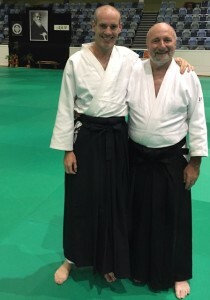 The Doshu, who is the head of Aikido in the world and the grandson of the founder of Aikido, is here from Japan. We have a bunch of very senior Aikido instructors from all around the world … more sixth and seventh dans than you could poke a boken (wooden sword) at. There are definitely people here who are more technically proficient, although he’s a sixth dan himself, so he’s not too shabby. There are some teachers whose Aikido is just beautiful to watch, and others who are brutally effective. The thing I love about Ray is the unadulterated child-like joy he gets when you get something right. I’ll do a wrist lock that doesn’t work. Ray is a retired painter with Popeye-like forearms, so a wrist lock has to be pretty good to make him move. He’ll tweak a couple of things for me and then say “yes, yes, yes” with a big grin on his face as he goes crashing into the mat. He’s a teacher that makes me want to learn from him, and makes me want to get better, and I reckon for any teacher (including a mentor or coach or any thought leader really) that’s half the battle. And it’s certainly something that I want to emulate with anyone I teach. I’d love to hear your thoughts – what makes you want to learn from someone? You can leave them below.